Geoscience today is a space-age science making extensive use of remote sensing data, remotely collected data, high performance computing, and state of the art data visualizations. These new research tools can often be accessed on-line making them particularly suitable for use in undergraduate teaching. 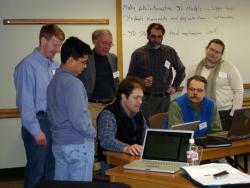 This workshop built upon prior workshops on teaching with visualizations and large data sets. For related resources, please see Using Global Data Sets in Teaching Earth Processes and Teaching Geoscience with Visualizations: Using Images, Animations, and Models Effectively. This workshop was part of the On the Cutting Edge professional development program for current and future geoscience faculty, sponsored by the National Association of Geoscience Teachers with funding provided by a grant from the National Science Foundation - Division of Undergraduate Education .